Yes, you read that correctly. It appears that Newt Scamander (Eddie Redmayne) may not play the leading role in some movies after Fantastic Beasts and Where to Find Them. There will be some talk of the movie’s major twist so make like the Invisible Cloak and disappear from sight if you don’t want to see spoilers. The first Fantastic Beasts movie may be out in theaters but that hasn’t stopped people talking about what the (four!) 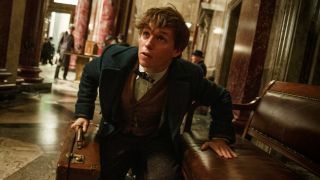 sequels hold in store – including what role Newt Scamander may (or may not) have in the upcoming movies. In fact, the movie’s big reveal (spoilers), that Colin Farrell’s Percival Graves was being impersonated by Johnny Depp’s Gellert Grindelwald, indicates that future Fantastic Beasts movies may focus heavily on the Dumbledore/Grindelwald conflict. Credence Barebone (Ezra Miller), who appeared to die at the end of Fantastic Beasts, looks to have a magic recovery in the works. In fact, they even cut a scene showing him travelling with Newt – possibly to Europe, the scene of Fantastic Beasts 2 – and to edge him closer to Dumbledore. The fantastically awkward Newt Scamander may be reduced to supporting cast by the franchise’s end but it remains to be seen just how much of a presence he will have in Fantastic Beasts 2 when it is released on November 16, 2018.